The AR-15 rifle is easily the most popular firearm in the USA today. The simple and popular design allows the user to outfit the rifle to their exact needs. Since the standard AR-15 fires .223 Remington or 5.56mm x 45 NATO cartridges, small game hunting is another preferred use for the AR series. With a few tweaks, one can turn a standard mil-spec AR-15 into a long-range, tack-driving, prairie-dog-slaying machine. The Varmint AR-15 also had an extended charging handle and battery assist lever installed. The first and most obvious upgrade is the barrel system. Slender 16-inch barrels are great for plinking and defense, but lack accuracy in the long run. A longer, thicker barrel is better for higher velocity, and a heavy bull barrel keeps the shots from drifting under sustained fire in those longer shooting sessions. 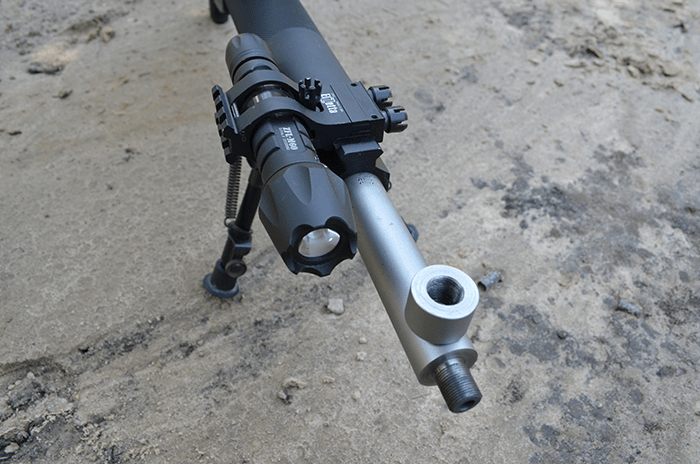 Along with the barrel, the fore end will need to be free-floated so that pressure from the bipod or rests won’t torque and affect the harmonics of the barrel, resulting in groups shifting downrange. The AR-15 used for this article had a 1-inch stainless steel bull barrel and a simple, smooth, free-floated tube with only a QD sling mount on the 6 o’clock forward position. The barrel will also dictate which gas tube you require. Barrels 18 inches and longer usually need a full-length rifle gas tube. The rifle gas systems tend to be less harsh on recoil than mid-length and carbine, so the shooter should notice a smoother cycle action. If you are planning to use a scope on your AR-15, it is recommended you have a lower gas block instead of a mil-spec front sight block that might interfere with your scope’s view. When this AR was purchased, the author was told it had a trigger job. If that was true, it was a very crummy job for it was soon changed to a Geissele High Speed National Match trigger group. Geissele makes excellent triggers, with their two-stage being one of the most dependable and preferred. The first stage has a little travel with almost no weight, and the second stage breaks barely over 2 pounds of pressure with no creep. Shooters accustomed to gritty, creepy mil-spec triggers instantly fall in love with Geissele. The optic and mount will also contribute to the accuracy and reliability of your rifle. The rule of thumb is to spend whatever your rifle cost or more on the optic. On this project, we mounted a Leupold Mark IV LR/T 6.5-20x50mm with a mil-dot illuminated reticle in a 30mm tube. When shooting long range, the marksman can choose if he will be dialing in every shot or using a ballistic drop reticle. With this Leupold, we have both options. Custom threaded barrel, endcap, and Elzetta light for night hunts. 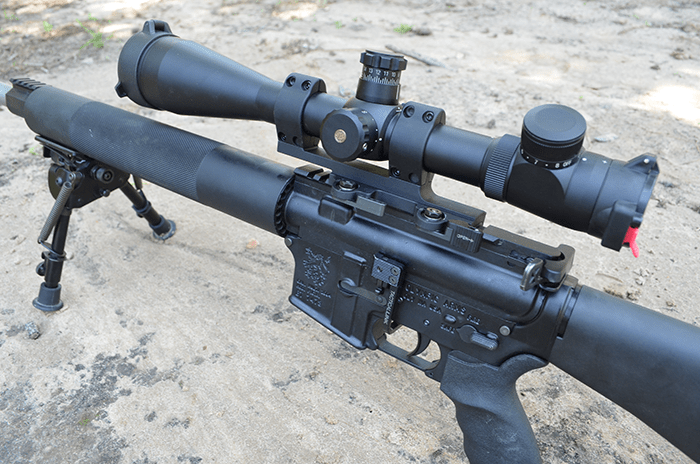 The scope was mounted on a LaRue QD SPR 1.5 base for the optimum height on the AR-15. The Leupold scope was very easy to zero, and within two rounds and one adjustment it was hitting center. The reticle has reference marks and every mil-hash is about 3.6 inches at 100 yards. With the correct formula and load data, the shooter can calculate both target distance and holdover by using the scope’s reticle. The illuminated reticle is very useful in low light hunting, and leaves a small open center so small targets at long ranges won’t be blocked out. After mounting the scope, the standard charging latch was difficult to grasp. We installed an extended latch for ease of loading, plus a “Battery Assist Lever” so the bolt release can be operated with the trigger finger without having to use both hands. The Harris bipod was easy to mount onto the forward sling stud (20-round magazines are preferred because they interfere less with bench rest and prone positions than the longer 30-round magazines). The last work performed on the rifle was threading the barrel by a machine shop. Normally varmint hunting doesn’t require muzzle accessories and heavy AR uppers come without threads. But once I acquired a suppressor, I thought it would be nice to be able to hunt without damaging my hearing. The machine cut 1 inch off my 20-inch barrel, then re-crowned the muzzle threaded the 1-inch cut-off piece as an end cap. Now it can be screwed back on and look like the original bull barrel with a small hairline seam. 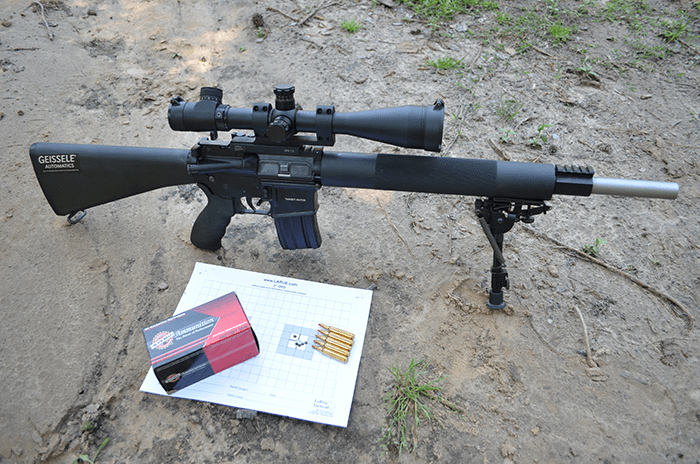 This AR-15 Varmiter tore a 5 holed group with Black Hills 68 grain match ammo. The only other recommended accessory on a dedicated varmint rifle would be a high intensity light for night hunts. It was easy to mount the extremely durable Elzetta ZFL-M60 light with the ZROC offset mount to the railed gas block. It provides enough light to hunt anything within 100 yards. For longer distances, the Streamlight TLR1-HP has an extremely bright focused beam useful beyond 200 yards, and is available in green just for varmints. 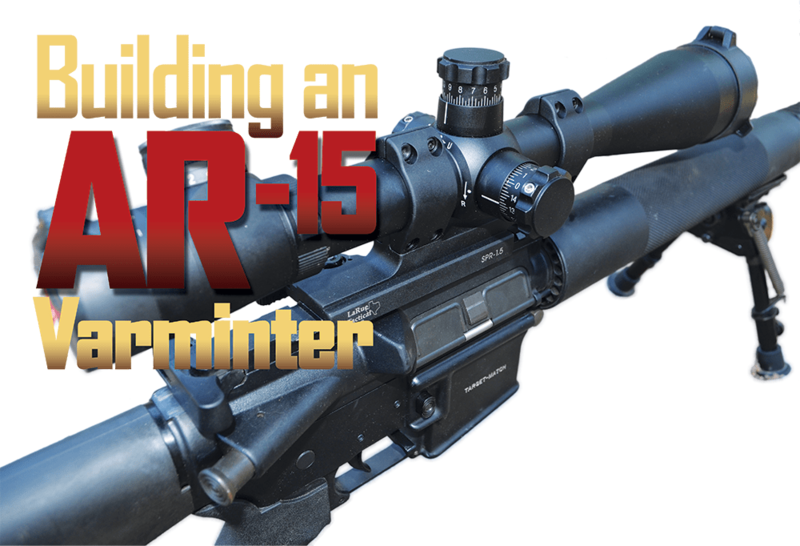 Once again, the possibilities are endless with your AR-15. You are free to mix and match all the parts and accessories to optimize it for your mission. Just have the end game in mind and have fun with it.